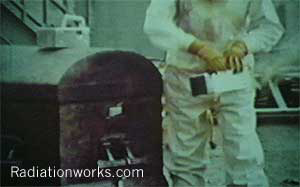 Image Archive: The SL-1 Reactor Accident - Lead casket containing the radioactive body of a reactor operator. This image shows the lead casket containing the body of one of the three operators killed in the SL-1 reactor explosion near Idaho Falls, Idaho. The device on top of the casket is a radiation survey meter, most likely a military radiac used for monitoring gamma radiation.